When morning sneaks up on you, you need something that packs a punch, and this smashing new mug will deliver a fistful of your favorite beverage. Sleek ivory high-fire ceramic contrasts dramatically with the steely metallic handle. Consider the Fisticup "protection" from whatever your day decides to dole out. Sometimes the greatest fight is just getting through the day. Assure you come out on top with the Fisticup. 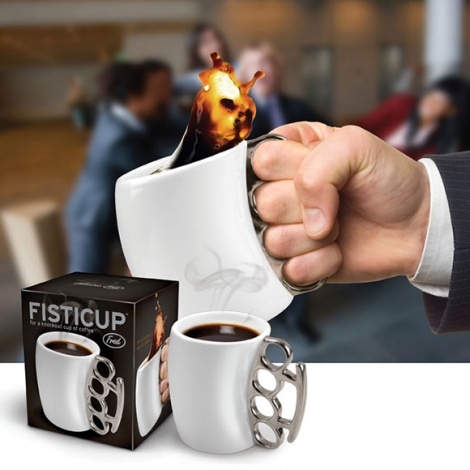 Complete with sleek black base and metallic brass knuckle handle, drinking coffee has never been so badass. Dishwasher friendly, but not microwave safe.